There are plenty of things to do in Sri Lanka for everyone -- no matter whether you're a culture vulture or a beach bum! The country is growing in popularity as a tourist destination every year, and is featuring on more and more itineraries. Compared to neighboring India, Sri Lanka is a much easier country to travel in. Distances are shorter, it's cleaner, cheaper, and less crowded. Wildlife safaris, nature, tea plantations, exploring historic cities and ancient ruins, diving and even surfing and can all be incorporated into a trip to Sri Lanka. Sri Lanka has a tropical, monsoonal climate. The high season runs from December until March, and is weather-wise the best time to visit the southwest part of the country (Colombo, Galle, and Hill County). The weather in Sri Lanka's north and east is best during the low season, from May until August. April and September are shoulder season months, and offer the best chance of good weather if you want to visit the whole country. Although it's only a small island, Sri Lanka has an impressive eight UNESCO World Heritage Sites. Two of them are major cities. Galle, situated on the southwestern tip of Sri Lanka, is surprisingly stylish and hip. This coastal city was founded in the 16th century by the Portuguese, and further developed in the 17th century by the Dutch. The main attraction is Galle Fort, and a sunset walk around it is mesmerizing. Kandy, in central Sri Lanka, is the country's second largest city. Known for its culture, it was the royal capital of Sinhalese Kings from 1592 to 1815 (when the British took it over). The Temple of the Sacred Tooth Relic was built within the royal palace complex and holds a tooth believed to have belonged to the Buddha. Want to see elephants in the wild? You're unlikely to find a better country in the world to do so than Sri Lanka! Uda Walawe National Park is the most popular place. However, Minneriya National Park is home to one of Asia's greatest wildlife spectacles, known as "The Gathering". More than 200 elephants gather in the one spot there during August and September each year! Here's a secret though -- nearby Kaudulla is just as good (and cheaper). It's possible to hang out with elephants up close at the famous Pinnawala Elephant Orphanage as well, which can be visited on a day trip from Colombo. If you're a wildlife enthusiast, you'll also enjoy leopard spotting on safari at Yala National Park. A more difficult to reach but less crowded alternative (without the hundreds of jeeps) that's known for its leopards is Kumana National Park. It has elephants and plenty of birds too. In addition, avid birders definitely shouldn't overlook Bundala National Park. Sri Lanka's remarkable natural beauty makes it ideal for enjoying the great outdoors. Horton Plains National Park, high up in Sri Lanka's Hill Country, offers among the most enjoyable walks in the country. Also in the heart of Hill Country, for exciting hiking head to densely vegetated Knuckles Mountain Range. If you feel like following in the steps of the Buddha, make your way up to Adam's Peak with hundreds of pilgrims. Further south, Sinharaja Rain Forest is a UNESCO World Heritage Site with outstanding jungle hiking and birding. As Sri Lanka is an island, unsurprisingly, gorgeous beaches are a highlight. There's a beach to suit all requirements, from party vibe to seclusion. Unawatuna beach, near Galle on the south coast, is one of the most lively beaches. Unawatuna Diving Center is a recommended place to learn scuba diving there, and water sports are also a fun activity at Unawatuna. Mirissa beach, the next major beach destination south of Unawatuna, is more peaceful. Whale-watching and snorkeling are popular activities there. Those who really want to get away from it all will find deserted beaches in the south and east. Consider Navalady, Kalkudah, and beaches along the Uppuveli to Nilaveli strip. There's a growing surf scene at Arugam Bay, on the east coast directly opposite Colombo. Sri Lanka has more than 2,000 years of religious heritage and the longest continuous history of Buddhism of any Buddhist nation. About 75% of the population is Buddhist. Some of the statues of Lord Buddha are quite astonishing. 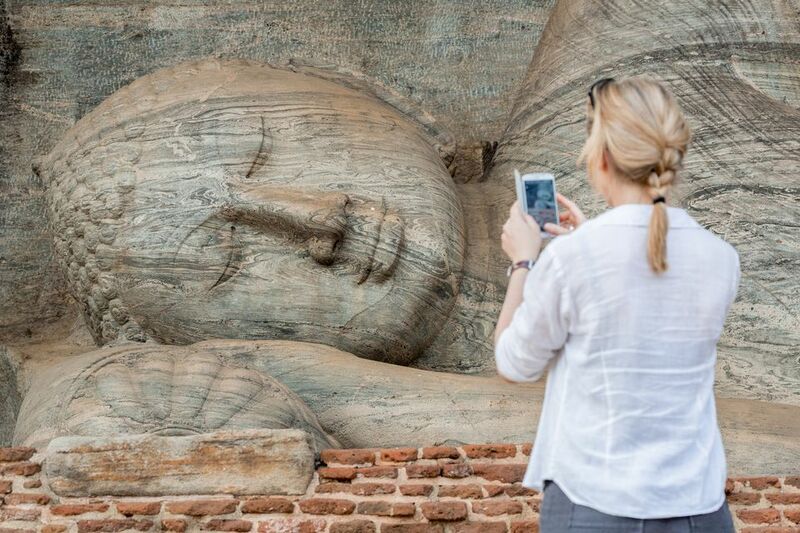 At the ancient UNESCO World Heritage Site of Polonnaruwa, there's a spectacular group of Buddhas carved from a solid granite outcrop. One of them is a 14 meter long reclining monolithic Buddha statue from the 12th century. Polonnaruwa was the second capital of Sri Lanka, after the destruction of Anuradhapura in 993. The UNESCO-listed Anuradhapura ruins are also evocative. However, Isurumuniya rock temple is delightfully devoid of tourist hordes and there's a large colorful reclining Buddha in its temple complex. More marvelous Buddhas can be found at the Dambulla cave temple complex, about 2 hours north of Kandy. Each of the five rock-cut caves contain statues and paintings related to Lord Buddha and his life. The feature is a towering golden Buddha. Ritigala, an ancient forest monastery dating to the 1st century BC, is also worth seeing. Sri Lanka's tea is famous throughout the world and it's interesting to visit tea estates to see how it's produced. If you're a tea lover, this is a must-do! Tea replaced coffee production in Sri Lanka in the mid 1800s, after coffee plantations were extensively damaged by disease. Sri Lanka is now the fourth largest tea-producing nation in the world. The majority of tea estates are located in Hill Country and adjoining regions in the south. Many run free tea factory tours. Colonial Nuwara Eliya is at the heart of the upper part of Hill Country, and Pedro Tea Factory is one of the best tea plantations to visit in the area. The factory was built in 1885 and comprehensive tours of it are offered. Bluefield Tea Gardens is also worth visiting there. About 30 minutes from Galle in Ahangama, Handunugoda Tea Estate produces more than 25 varieties of tea (for the Herman Brand). Virgin white tea is a specialty. Sri Lanka's railway network may be described by some as antiquated (rather than nostalgic) but it's also very atmospheric and scenic. One of the most popular journeys is through Hill Country to the town of Ella. However, from Ella to Badulla (an hour one way) is arguably even more picturesque, and there's a large Buddhist temple within walking distance of the train station there. Many visitors spend a couple of days relaxing in Ella, as it has some of Sri Lanka's best guesthouses. Seeing Sri Lanka's captivating landscape from above will be a highlight of your trip and an unforgettable experience. Imagine floating serenely across misty mountains and jungle as the sun comes up. Sunrise Ballooning and Sri Lanka Ballooning are reputable companies that both conduct early morning hot air balloon flights from Dambulla, in the middle of the Cultural Triangle. The cost is $210 for adults, and $160 for children aged between seven and 12. This includes a one-hour flight, breakfast, champagne toast on landing, and hotel transfers from Habarana, Sigiriya, Dambulla and Kandalama. Undeniably delicious, Sri Lankan cuisine can be hot or mild, according to your preference. Rice and curry -- all kinds of curry! -- are the staples of a meal. The food generally described as Sri Lankan is that of the Buddhist Sinhalese community, which makes up the majority of the country's population. The curries are kind of like Indian curry, but the use of spices is different and coconut is an integral ingredient. Unfortunately, hotels and restaurants that cater to western tourists tend to modify the dishes and water them down. If you do want to sample authentic, traditional Sri Lankan cuisine, choose homestay accommodations or family-run guesthouses. The hosts will usually be happy to cook it for you! Otherwise, drop by a simple local roadside restaurant. If you want to learn to cook Sri Lankan cuisine, try Karuna's Cooking Class at Sonja's Healthfood Restaurant in Unawatuna. A trip to Sri Lanka wouldn't be complete without doing some shopping. Apart from tea and spices, handicrafts (masks, wood carvings, batiks, leather work, and metal work), and designer products are worth buying. The capital, Colombo, is the standout place for shopping. It's full of stylish boutiques, markets and galleries. You'll find everything Sri Lanka has to offer there. Head to Paradise Road (a store not a street) in Colombo for trendy home decor. Galle also has some lovely boutiques and galleries. Don't miss hitting Colombo's markets in Pettah as well, for a great dose of local flavor (and chaos). Do be prepared to bargain! India is well known for Ayurveda, but it's also big in Sri Lanka. This system of natural medicine uses herbs, massages and other specialist treatments, and diet to balance the body. You'll find plenty of places that offer Ayurveda on Sri Lanka's west coast. If you're looking for a decent Ayurvedic resort, head to the area around Beruwela, just north of Bentota. Barberyn Reef Ayurvedic Resort (read reviews on Tripadvisor) is highly regarded and it offers yoga, meditation, and cooking classes, as well as a full range of treatments. Luxurious Heritance Ayurveda Maha Gedara is also recommended. Why Do These Devotees Pierce Their Faces and Bodies During Thaipusam?